Bryce Johnson has been designing accessible experiences and technology for over 15 years. As a member of Team Xbox he was part of the core team that started the inclusive design and accessibility practice. Bryce worked across Microsoft teams to launch the assistive technologies on the Xbox One, including Copilot. Bryce initiated and designed the very first Inclusive Tech Lab at Microsoft, which has now hosted over five thousand visitors; it is a facility where people can explore how gamers with disabilities interact with Microsoft games, services, and devices. 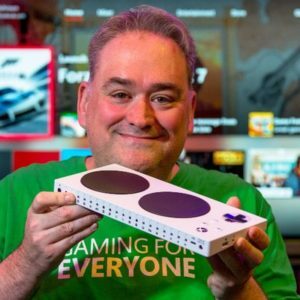 Bryce has also been a member of the Xbox Adaptive Controller team ever since he was a lead on its inception as a hack project at the 2016 Microsoft Oneweek Hackathon. Bryce recently transitioned to the Product User Research team, where he will be devoted to ensuring all Microsoft devices are designed and built to be inclusive.